Casino Bonus King makes bonuses transparent and is honest about what you get. This time we're going to describe the Europa Casino Bonus. This online casino is promoting a $2400 bonus, but what exactly do you have to do to claim that bonus? And what rules are involved in clearing them? Europa Casino gives you a 100% bonus on your first deposit, with a maximum of €/$/£100. This 2011 bonus will be instantly credited to your account, but you will have to clear it before being able to make a withdrawal. The minimum play through requirement is 40 times the bonus amount, meaning that to clear a bonus of $100 you will have to wager at least $4000. Not every casino game qualifies for the play through requirement: Baccarat, Roulette, Sic Bo, Darts, Heads or Tails, Video Poker, BlackJack Switch, BlackJack Surrender, Pontoon, and Craps games will not help you clear the bonus. Europa Casino gives high rollers a special treatment. When you make the first deposit of $1000, you will be eligible for a massive $500 bonus! 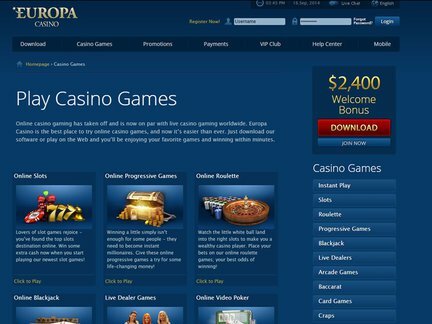 Europa Casino is different in that it not only offers a 100% deposit bonus to first depositors. Every player has the right to claim a monthly 100% deposit bonus. After making your deposit you will have to contact support in the casino lobby to claim your bonus. This bonus has to be cleared before the end of the month, and can only be claimed once a month. The maximum amount to claim is €/$/£100. The same rules for clearing apply as to the first deposit bonus. There is a way to be eligible to another deposit bonus. When you are going to make a deposit, considering using one of the following methods: Wire Transfer, Sofortüberweisung, POLi, or Ukash. Each of those methods will provide you with an extra 15% deposit bonus. And each of the following deposit methods will give you a 10% deposit bonus: Moneybookers, Giropay, Nordea, EPS, Enets, EcoCard, Paysafecard, Instadebit, Moneta.ru. To claim the bonus, simply contact support in the casino lobby and ask for your 10 or 15 percent extra. The minimum deposit to be able to claim this bonus is €/$/£50. The bonus is subject to a play through requirement of 2 times your deposit + the bonus. So if you deposit $100 with Moneybookers, you will receive a $15 bonus, and you need to wager at least 115 x 2 = $230. Please note that this bonus cannot be used in combination with another bonus. Also note that the maximum bonus is limited to $250 each month, and $2000 for each account.